This was yesterday at Clevedon, from the Pier to the Bay, turning with the tide, and back again. It was a little bumpy in the water and here is the pier and home looming, though from my vantage point I couldn’t actually see it that well. Apologies to Colin Hill of Chillswim, I failed to do the bright orange of the tow-floats justice – Their incongruous orangeness much appreciated in water like this, not least for being able to keep an eye on your fellow swimmer as we both bobbed about a little bit cork-like! 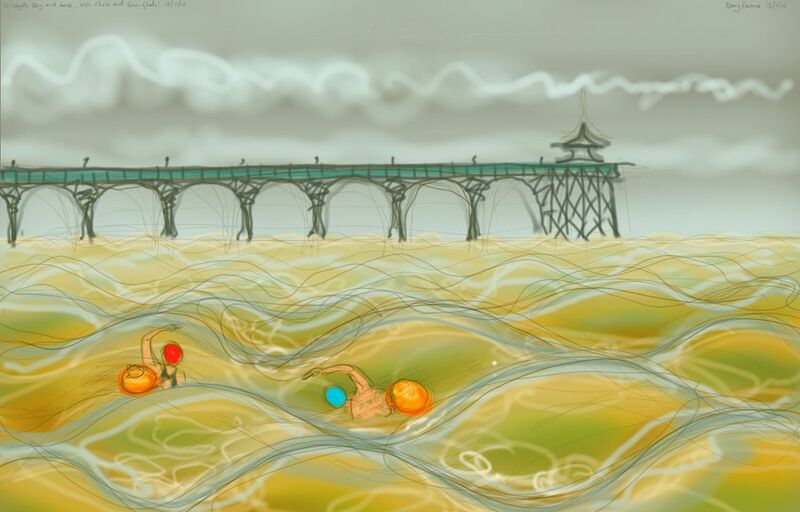 This entry was posted in swimming and tagged art, chillswim tow float, Clevedon, Clevedon Pier, drawing, illustration, open water swimming, sea swimming, swimming, tow float on July 13, 2015 by Nancy Farmer.